The beloved Community Day will be held on Saturday, June 18 at the beautiful Nelson County Preserve. The evening of music, food, and family fun will directly support the Giving Hope Foundation, an organization that believes every cancer patient deserves a sense of normalcy while focusing on healing in their fight against cancer. Throughout the day, local Virginian bands, The Fat Catz, Disco Risque, DJ Willians Projekt, and The Dharma Initiative will compete in Rockin’ to LOCKN‘, for the chance to win a spot as a performer at the festival on August 25 – 28. 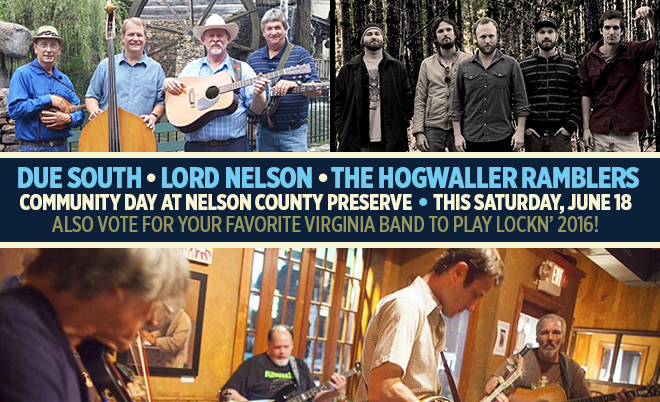 Additional music performances will be provided by Lord Nelson, Hogwaller Ramblers, and Due South. This event was put together by music lovers, for music lovers. Featuring local vendors, kids activities, food, beer and wine, Community Day is a chance to make memories that will last a lifetime.